A good understanding of diamonds is necessary before you begin shopping. 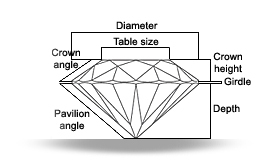 Learning about diamonds is really learning about the "four Cs" of diamonds - cut, clarity, color and carat weight. These are the criteria jewelers use when grading diamonds, and they're the ones you'll need to understand to find the right diamond for you. Diamond is a crystalline form of carbon. Its rarity makes it extremely valuable and precious. The combination of the 4Cs, namely Cut, Clarity, Carat and Colour, determines the value of a particular diamond. Because cut is so important, several grading methods have been developed to help consumers determine the cut of a particular diamond. While nature determines a diamond's clarity, carat weight and colour, the hand of a master craftsman is necessary to release its fire, sparkle and beauty. When a diamond is cut to good proportions, light will reflect from one mirror-like facet to another and disperse through the top of the stone, resulting in a display of brilliance and fire. Diamonds that are cut too deep or too shallow lose light that spills through the side or bottom. As a result, poorly cut stones will be less brilliant and beautiful and certainly less valuable. A well cut or faceted diamond, regardless of its shape, scintillates with fire and light, offering the greatest brilliance. The greater a diamond's clarity, the more brilliant, valuable and rare it is. Virtually all diamonds contain identifying characteristics, yet many are invisible to the naked eye. Under the scrutiny of a jeweller's 10X magnifier, natural phenomena called inclusions may be seen. These are nature's birthmarks. The number, colour, type, size and position of the birthmarks affect a diamond's value. Major inclusions can interfere with the path of light that travels through a diamond, diminishing its brilliance and sparkle and therefore its value. One carat is equal to 0.2 gram or 100 points. Because large diamonds are found relatively infrequently in nature, diamonds' worth go up almost exponentially with their weight. Diamonds can be classified into "colourless diamonds" and "fancy coloured diamonds". Colourless diamonds are graded by colour, starting at D and continuing through the alphabet. Truly colourless stones, graded D, are treasured for their rarity and value, and are highest in quality. Fancy coloured diamonds in well defined colours that include red, pink, blue, green and canary yellow are particularly rare and very highly priced. Things you should know about the care and maintenance of your jewelry. 1.Avoid putting on cosmetics, spraying perfume or applying body lotion when wearing jewelry, because they might contain chemicals that tarnish the surface. Chlorine in swimming pools has the same effect. 2.Regular cleaning of your jewelry keeps them shining and beautiful. Soap and water used with a soft brush is effective for most jewelry care. However, when cleaning pearls, do not use soap. Simply wipe the surface gently with a soft damp cloth. 3.Protect your jewelry from scratches when it is not being worn by separating it from other jewelry, using separate compartments in your jewelry box. 4.Frequently check your jewelry for scratches, cracks, missing prongs or weak spots. Be sure to take them to a reputable jeweler for their annual check-up. 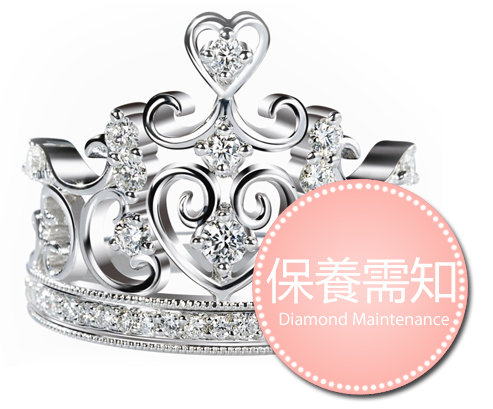 Better yet, you are welcome to take your jewelry to any PINKBOX HKSAR Outlets for periodic cleaning and examination.